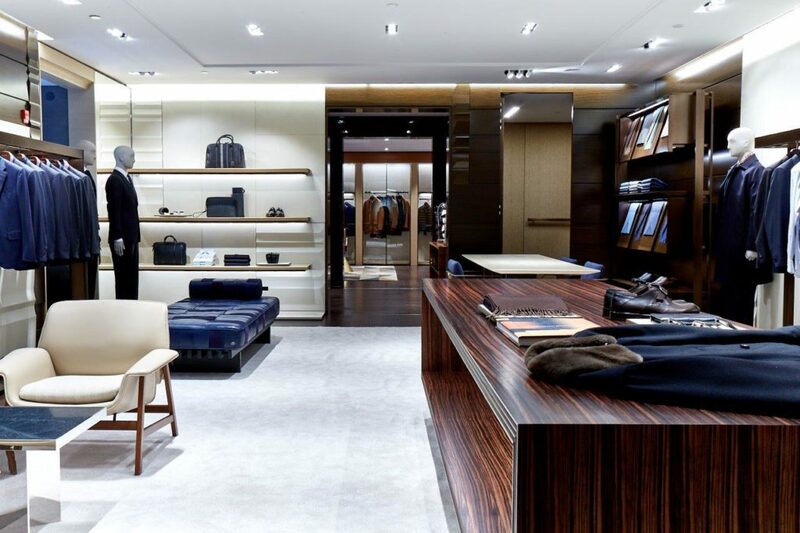 Ermenegildo Zegna has opened a new flagship in a New York landmark — the storied Crown Building. 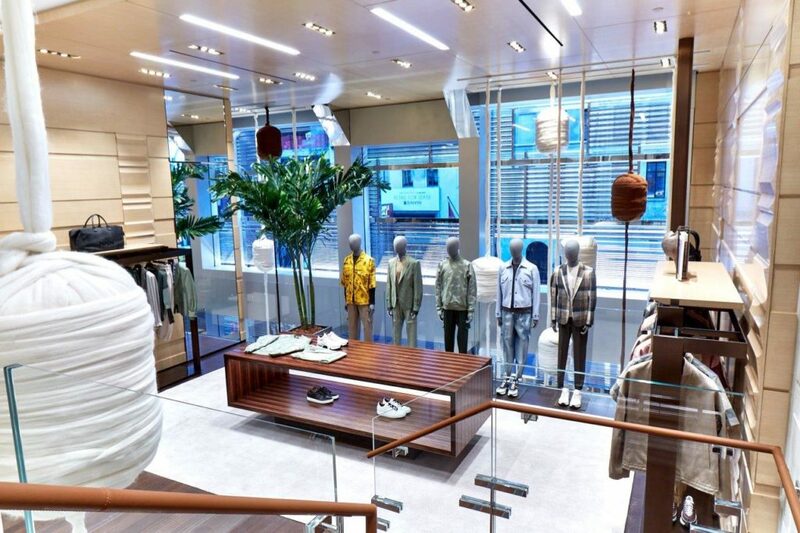 Located at 4 West 57th Street and covering 7,128 square feet, the store was designed by longtime Zegna go-to architect, Peter Marino, who conceived a concept for the unit. 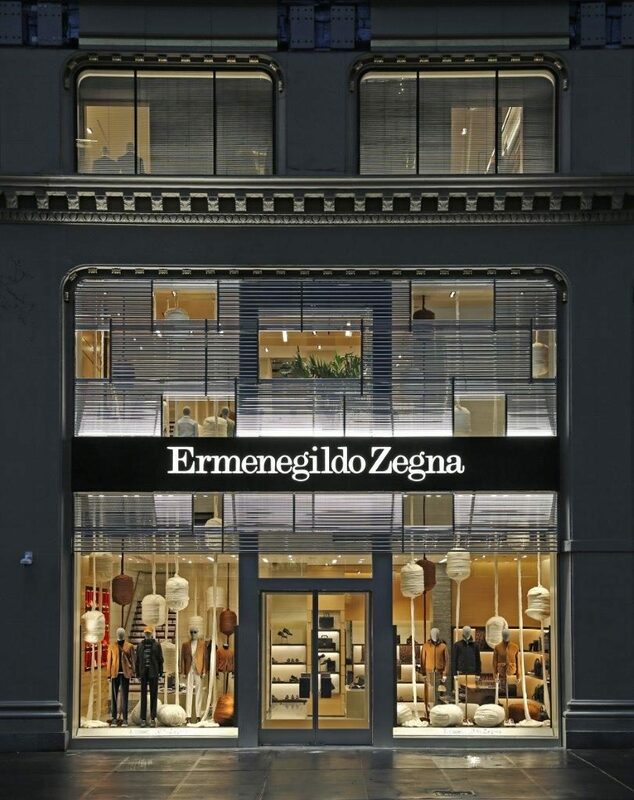 I had the pleasure of visiting the store with Andrea Perasti, Store Development Project Manager for Ermenegildo Zegna USA. The striking facade of the flagship is composed of metallic strings, a reference to yarns and the company’s textile expertise, which overlay two glass floors. 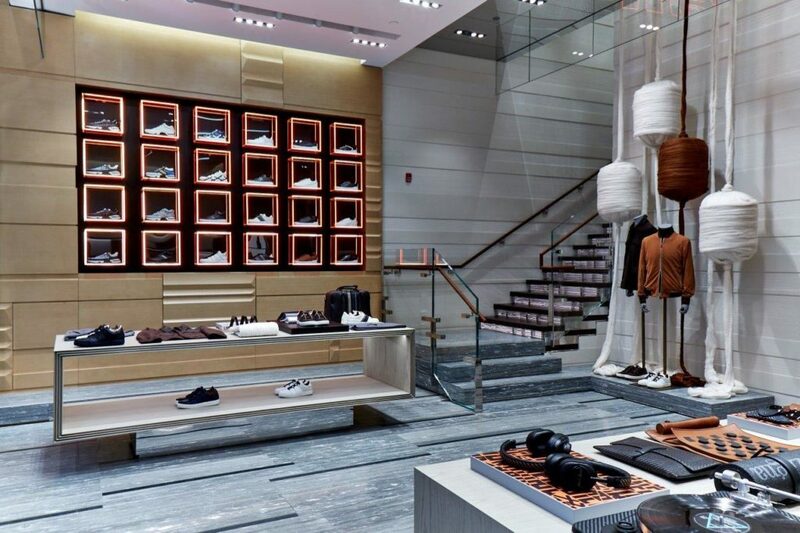 Leather goods and a dedicated shoe area stand on the ground floor, both characterized by natural tones of cerused ash wood, bleached mahogany and Vals stone flooring with serpentine inserts. The mezzanine level is marked by light colors and walls lined in warm white wallpaper and a grainy plaster. 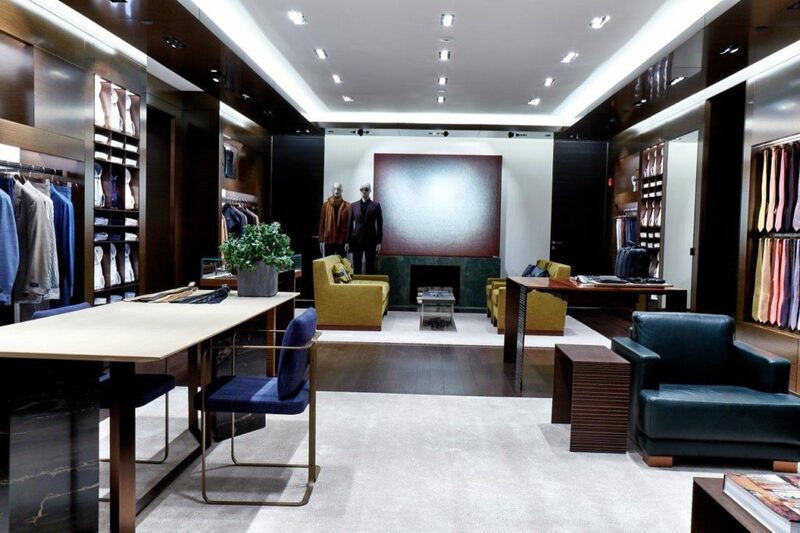 The sartoria, luxury leisurewear, couture and the personalization room with its master tailor and bespoke clothing further raise the luxury quota on the first floor. 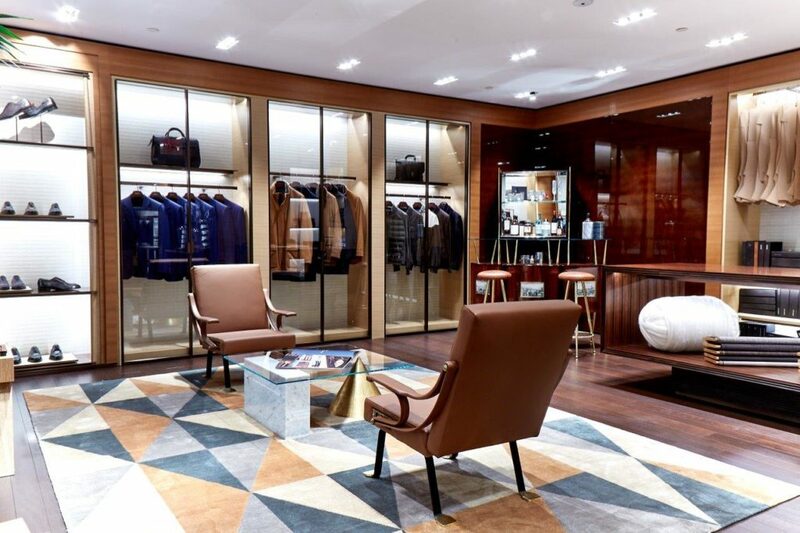 With its matte teak, lacquered wood and mix of modernist and vintage elements, the personalization room has been furnished with a vintage Italian bar, historical photos, a geometric pattern carpet and sophisticated, intimate Gardella lounge chairs. Given Zegna’s tradition of supporting the arts, the third floor houses the 2012 Zegna Liquid Touch work, by Pittsburgh-born artist Emil Lukas, consisting of silk thread over a painted wooden frame with nails.